A new U3A is to be launched in The Park in Nottingham on Tuesday 18 October 2016 at 10 o’clock at The Nottingham Squash Rackets Club, Tattershall Drive, The Park, Nottingham NG7 1BX. Click here for more information. 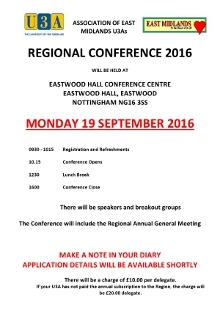 The Regional Conference and AGM 2016 will be held on Monday 19 September 2016 at the Eastwood Hall Conference Centre, Eastwood, Nottingham NG16 3SS. The conference will include the Regional Annual General Meeting. To print the Application Form click here. To view and print the Poster and Programme click here. Full information on the Events webpage. The full set of documents for the Conference and AGM is in the Publications section. 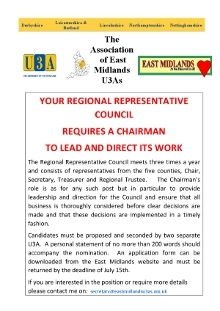 Your Regional Representative Council requires a Chairman to lead and direct it’s work. The Regional Representative Council meets three times a year and consists of representatives from the five counties, Chair, Secretary, Treasurer and Regional Trustee. The Chairman’s role is as for any such post but in particular to provide leadership and direction for the Council and ensure that all business is thoroughly considered before clear decisions are made and that these decisions are implemented in a timely fashion. Candidates must be proposed and seconded by two separate U3As. A personal statement of no more than 200 words should accompany the nomination. To view and print the poster click here. To view and print the nomination form click here. The application form must be returned by the deadline of July 15th. If you are interested in the position or require more details please contact secretary Phil Grace on: secretary@eastmidlandsu3as.org.uk. 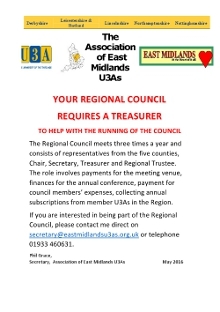 Your Regional Representative Council requires a Treasurer to help with the running of the council. The Regional Council meets three times a year and consists of representatives from the five counties, chair, secretary, treasurer and regional trustee. The role covers payments for the meeting venue, finances for the annual conference, payment for council members’ expenses and collecting annual subscriptions from member U3As in the region. To view and print the poster click here. To apply please contact the seretary Phil Grace via email at secretary@eastmidlandsu3as.org.uk or telephone 01933 460631. 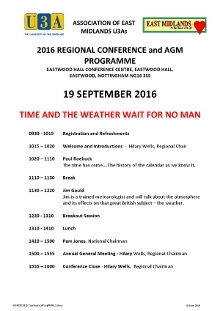 The conference will include the Regional Annual General Meeting. Make a note in your diary, application details will be available shortly. committee members would gain a useful insight into how committees work from either of the two workshops. The beauty of workshops like this is the opportunity they afford delegates to share experiences by networking with members of other U3As. Full information and booking details are in this National Workshops 2016 Leaflet. 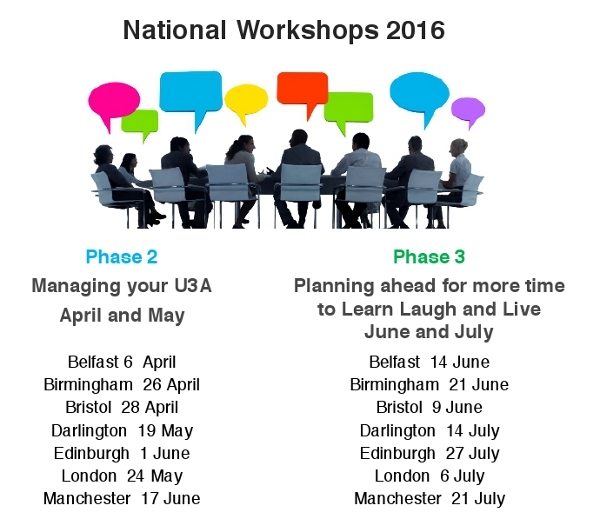 Information for notice boards is on this National Workshops 2016 Poster. The first East Midlands U3As Summer School to have been held in August 2016 has been cancelled. With the low number of applications the event would not have been a viable proposition. This is a great disappointment to everyone.